Laura Bang, curatorial assistant at Villanova University’s Special Collections and Digital Library, and Ruth Martin, Digital Library intern, explore an early 20th-century scrapbook put together by Company 62 of the New York City Fire Department. Detail from the illustration adorning the front of a 1907 edition of Happy Days, a juvenile fiction newspaper aimed at “Young and Old” – Source. When most people think of the collections in museums, archives, and research libraries, they think of the grand collections — the papers of famous people, the documents of important events, the artifacts of significant artistic movements or time periods. However, much of history happens between big events, to ordinary people. Often these quotidian histories are overlooked. The Special Collections of Villanova University’s Falvey Memorial Library has its share of impressive holdings — one of the first things that most visitors notice upon entering the Rare Book Room is a Union Army frock coat that was worn by General William Tecumseh Sherman and the Library is well-known for the Joseph McGarrity Collection, which consists of books and personal papers relating to Irish and Irish-American history. Alongside the books and artifacts made remarkable by the famous names connected with them, however, we also have a good collection of items that document the more prosaic lives of everyday people. These items cannot be found in a rare book catalogue, but they are no less rare or valuable. Indeed, we have acquired our “ordinary” collections from eBay, through personal connections, and from a forgotten corner of our own library’s basement. The once-widely-circulated newspapers that formed the basis of most people’s daily or weekly information and leisure reading; the letters that detail minutiae of bygone businesses and pleasures; the scrapbooks painstakingly assembled by people that no one now remembers — all these tell the stories of everyday lives. Because these items were viewed as mundane or commonplace, they were often discarded, making them all the more rare, so it is often a remarkable feat for these items just to survive. One such item is the scrapbook kept by Company 62 of the New York City Fire Department from 1906 to 1909. Rescued from an eBay auction by Villanova’s Digital Library staff, this one-hundred page scrapbook is packed with letters, forms, and memoranda that the Engine House received, recorded, and filed away for future reference, with most pages containing multiple items. A few pages and many items are missing, but the meticulously maintained index at the beginning of the scrapbook helps fill in the gaps. Together, the index and the remaining content paint a picture of a fire department and a city confronting and adjusting to a period of rapid social, political, and technological change. 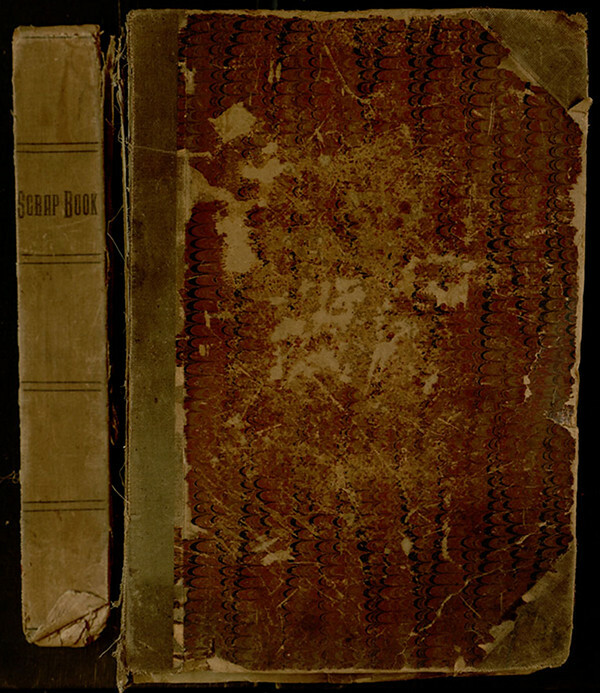 The scrapbook’s poor condition made it an ideal candidate for digitization. Its brittle and darkened edges suggest the scrapbook itself may have survived a fire – Source. 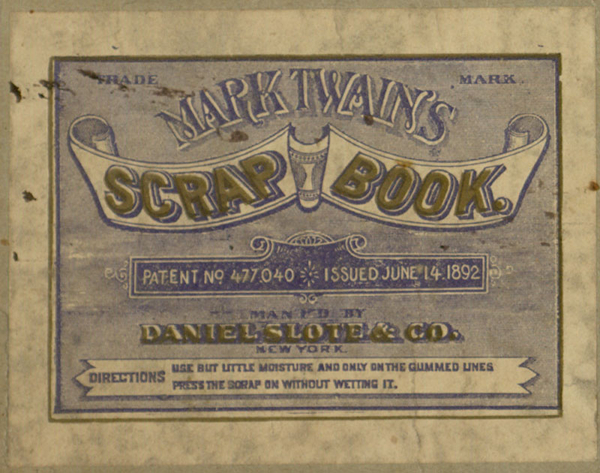 To file their incoming correspondence, Company 62 made use of a scrapbook designed by Mark Twain. He patented the time-saving idea of pages with glue pre-applied – Source. The material included in the scrapbook comes from various sources, but the primary author is Edward Croker, the relatively young Chief of the Fire Department. The length and content of his service to the New York City Fire Department suggests a genuine commitment, but few doubted that he had come by his position through the influence of his uncle, Richard Croker, the Boss of Tammany Hall throughout the 1890s. Newspaper accounts of Chief Croker’s tenure suggest he had his share of friends and enemies. Appointed Chief in 1899, he was forced out of his position in 1902 only to be reinstated eighteen months later in a unanimous court decision. Throughout his time as fire chief, rumors persisted that Croker handed out contracts and favors to his friends and otherwise participated in the patronage system that typified New York City politics at the time. Most of the circulars, letters and memoranda in the scrapbook were from Fire Chief Edward Croker – Source. The scrapbook shows the New York City Fire Department contending with a changing, modernizing city, one that raised new challenges for fire prevention and control. Skyscrapers, crowded streets and tenements, and poorly regulated factories created a difficult landscape for firefighters in early twentieth-century New York, and new risks were constantly on the horizon. The huge population of New York City — one of the largest cities in the world in the early 1900s — created problems for which there was little precedent. In addition to “normal” problems of racing through crowded streets to reach the scene of a fire and having to manage fires across a wide range of buildings, from factories to hotels to wood-framed houses, the Fire Department also had to manage major events like parades and celebrations, such as the Hudson-Fulton Celebration in 1909 to commemorate the tricentennial of the “discovery” of the Hudson and the centennial of the invention of the paddle steamboat. The two-week-long event, including multiple parades and many other public events, manifested itself in a nine-page memorandum from Chief Croker, coordinating the work of the police and fire departments and preparing contingencies for managing fires in an unusually crowded space. The scrapbook shows that the fire department confronted some of these modern hazards with old tools. In 1909, the fire department’s fleet consisted primarily of horse-drawn engines and water pumps, although Chief Croker generally arrived at fires in his “locomobile.” The first “horseless fire engine” was not widely employed in New York until the 1910s. Still, the department employed a modern, bureaucratic system to manage the horses. 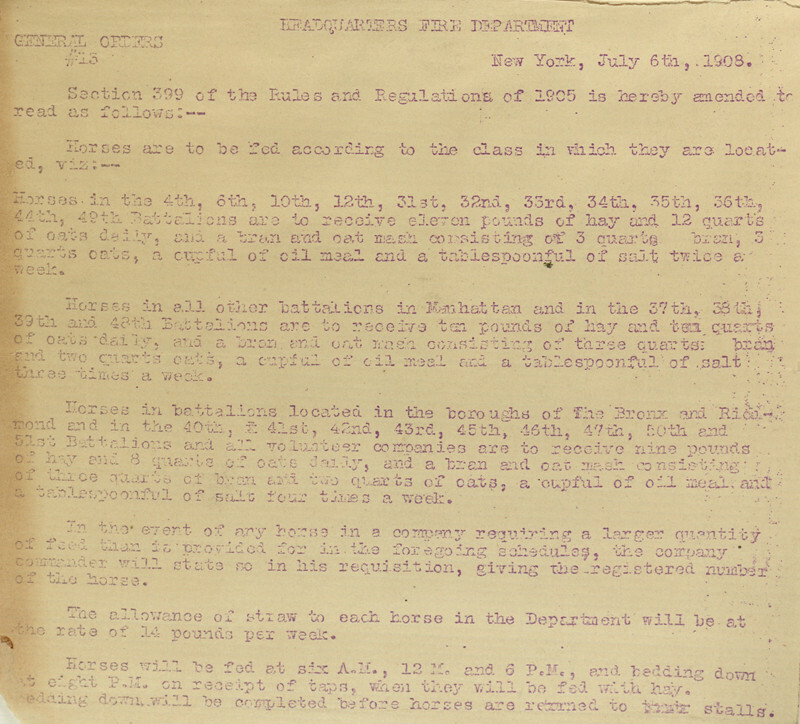 On July 6, 1908, General Order 13 specified the precise amount of feed that was to be apportioned to the horses at each station. In some cases, the horses at certain stations received more food than horses at other stations. Company commanders were expected to state in writing if any of their horses required more food than its officially allotted amount. In 1908, the fire department was emerging as a modern organization, but was still dependent on horses–a traditional form of transportation. Still, the department used modern, bureaucratic means to regulate and manage the horses’ feeding and care – Source. Though the Fire Department was still heavily dependent on horse power, the scrapbook shows that it had several new tools at its disposal in the early 1900s. Several memoranda address the new telephone system installed across the different Engine Houses in 1906. Then, as now, supervisors worried about the improper use of this relatively novel technology, stressing in a memorandum that the newly installed phones were not to be used for personal calls. The use of new, high-pressure hoses had a more dramatic effect on fire management in New York City. The scrapbook details the introduction of the new hoses in 1908 and, later that year, a memorandum lauds their apparent success in the control of fires. The risks faced by New York City firefighters in the early 1900s are captured in the scrapbook as well. A memorandum from October, 1907, identified the honorees at the department’s annual award ceremony. Newspaper accounts of the ceremony reveal that the nine men honored had together saved the lives of dozens of people, at great risk to their own safety. The heroics of firefighters were featured in some of the popular literature of the day as well. 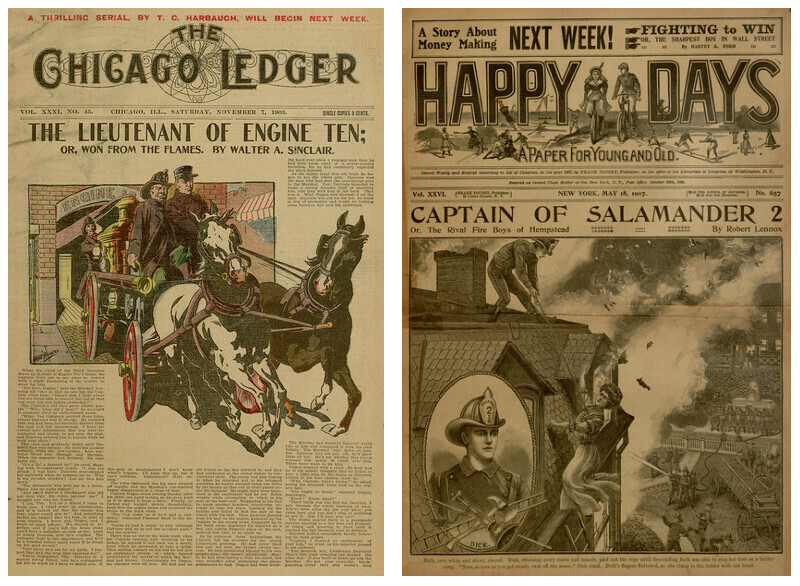 Happy Days and the Chicago Ledger were both widely-circulated papers featuring stories of adventure and romance. Source 1 & 2. In January of 1907, a fire at a paper factory proved too much for the many companies that had gathered to fight the blaze. The order was given to fall back, and although most of the firefighters escaped, four were still inside on the third floor when the floors above collapsed from the heat. Miraculously, one survived the collapse and was recovered from the burning rubble thirty-two hours after the collapse. His three comrades — Lennon, Mulligan, and Campbell — were less fortunate. The scrapbook’s index shows that the deaths and funeral arrangements of the three deceased firefighters were reported in special orders later that month. These three index entries about the deaths of Lennon, Mulligan and Campbell belie the tragic and dramatic circumstances of their deaths in a building collapse in January of 1907. (This image has been modified slightly to highlight the relevant text.) – Source. Unfortunately nearly all of the memoranda relating to the deaths and funerals of firefighters were removed from the scrapbook prior to its acquisition by Villanova. However, some of the memoranda that remain paint a picture of the regard and ritual afforded to the fallen by their colleagues, a tradition maintained to this day. 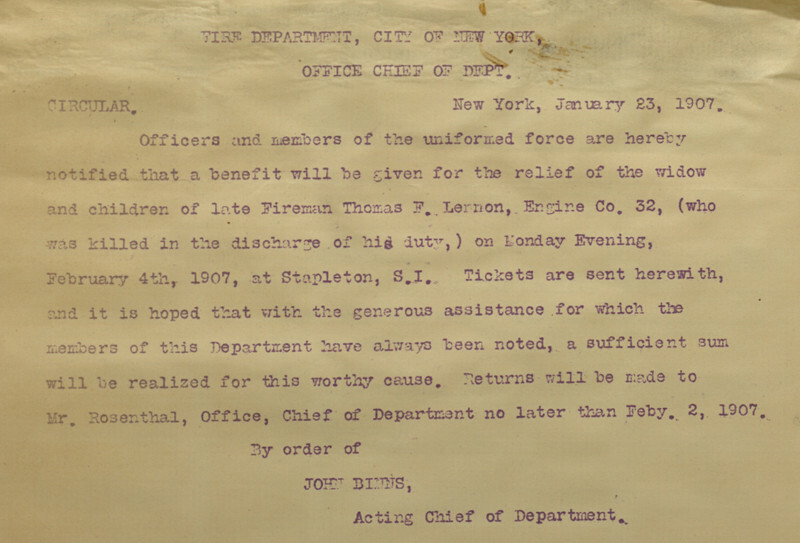 A circular dated January 23, 1907, discusses the organization of a benefit to raise funds for Lennon’s widow and three young children who were left with only a small pension on which to survive. The few remaining memoranda regarding funeral arrangements show that the fire department was actively involved in honoring its dead, assembling for funerals as pallbearers and honor guards. Thomas Lennon’s death in the collapse of burning building left his family with only a partial pension on which to survive. In response, his colleagues organized a fundraiser to provide assistance for his widow and three children – Source. Although unremarkable at first glance — a crumbling scrapbook full of bureaucratic memoranda and correspondence — a close inspection shows that there are, in fact, interesting details and clues about the day-to-day workings of a busy metropolitan fire department and the growth of a major American city. In addition, the scrapbook identifies the names and occupational trajectories of numerous rank and file firefighters in the New York City Fire Department of the early 1900s. Teasing out these details is one of the great joys of working with the more “mundane” collections and we are happy to be digitizing these alongside our more traditionally noteworthy items. Curious readers can view the entire Fire Department scrapbook online and search the Villanova Digital Library for other ordinary treasures rescued from obscurity. Laura Bang is the Digital and Special Collections Curatorial Assistant at Villanova University’s Falvey Memorial Library. She designs exhibits (both on site and online), oversees the Digital Library scanning operations, and enjoys reading dime novels from the popular literature collection. Ruth Martin joined Falvey’s Digital Library Team as an intern in the summer of 2012, where she is learning about the many aspects of running a digital library. One of her projects was to scan the Fire Department scrapbook described above as well as add the metadata to the digital resource.